Kids health is a great website to provide information to kids about health and is sponsored by the Nemours Foundation. The site is available in English and Spanish. There are three versions of the website : one for parents, one for kids and one for teens. The site is visually attractive and in the information is presented in a language easily read by kids or teens. It includes tips for dealing with feelings, for staying healthy and for dealing with everyday illnesses and injuries. There is also an excellent guide on puberty. 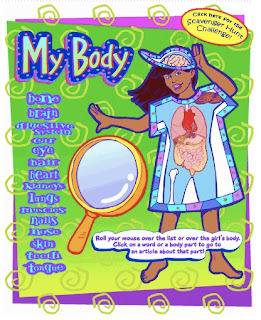 There is also a section about the human body where the student can use a magnifying glass to zoom on certain parts of the body and learn about them. There is a lot of easy to read information about each organ. It is a very good resource for research projects on the human body. There are also a few games such as Halloween Candy, a game in which the student realize how many calories there are in candies. "Mission Nutrition" is also a game in which they determine how good is their nutrition. It also includes some movies about asthma, how body works and how we play. For those who would like to do science fair project about health, there are some easy to do experiments that are described in details. The teen version of the site includes information about topic such as drugs, alcohol, tattoos, etc. It also provides information about sexually transmitted diseases and birth control. There are also some tips on how to cope with school and a part-time job. The site is very complete and provides good information. Also, many sites about health are sponsored by pharmaceutical companies and they have a commercial interest. This site doesn't seem to promote products.